Rhino News, etc. : Rhino to Cinema 4D and back! Rhino to Cinema 4D and back! Rhino.io is a connection and import/export plug-in that lets you directly open and save native Rhino files (3DM) from within MAXON CINEMA 4D. In addition, models that were changed in Rhino can be updated into CINEMA 4D while keeping material assignments and other changes inside CINEMA 4D intact, enabling you to work with Rhino and CINEMA 4D side by side. Rhino could therefore act as a NURBS plug-in for CINEMA 4D, connecting the best of both worlds. Rhino's precise and extensive CAD and NURBS toolset can be combined with CINEMA 4D's modern and flexible texturing, shading, and lighting tools. Models imported with rhino.io are also ready to use for any high-quality third-party rendering engines such as V-Ray for C4D, Maxwell, Fryrender, and more. 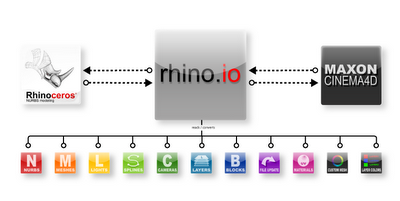 Rhino.io is available for a limited time introductory price of 79 EUR. The regular price will be 99 EUR. I had chance to work with this plug in, and it works great! It made my workflow, of getting CAD data from rhino to Cinema a lot faster... The prie is very reasonal for the time that one saves using the plug! It's about $126 USD. Ouch. I'd drop $50 on this any day, but $126 is kind of a lot, especially because this is a function that should have been provided by Maxon YEARS ago!